Build your own night vision add on with our professional housing it’s made from aluminium. 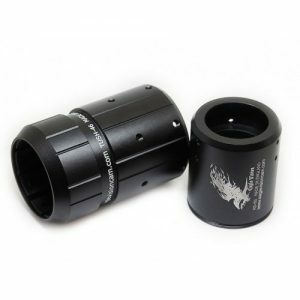 It will fit to 99% of the scopes from 39-46.5mm eye relief outer diameter. You would be able to fit almost any camera or CCD PCB to the camera housing. We didn’t make any holes on the back plate as people can make their hole to their Application, the extra back plate will be available soon if you need to change your configuration. Lots of more housing accessories comes for the same adapter such as battery pack, back screen, day/night range finder, laser IR, torch, front screen, fully adjustable solid brackets….